“What is the quality you most like in a man? Somebody needs to break it to MNPS School Board Chair Sharon Gentry that her title is “Doctor” and not “Reverend”. Twice a month she leads a meeting of individuals of equal status charged with overseeing our schools, she does not command a pulpit. Her vision is representative of but one of nine visions shaped by the voters of Davidson County. The last board meeting lasted 48 minutes, and without her postulating, it would have probably lasted eight. Now that we got that out of the way, let’s take a look at what actually happened at that meeting. The first order of business was next years school calendar. At the last meeting, the board was set to approve the calendar, but it was tabled in order to make a few more revisions. The elephant in the room here is the role that the Tennessee State University Homecoming Celebration plays in the decision making. This year Fall Break was moved back a week in order to concede with homecoming festivities. A move that put an unfair burden on teachers and students who were not set to participate in homecoming festivities. It’s long been a thorn in my side that we base district policy on a social event. I get that the Friday before Homecoming has the highest rate of teacher absenteeism of the year, but why is that okay? And why should the district condone that by altering its plans? Why should the majority of stakeholders sacrifice so that some may participate in a college ritual? I’m not downplaying the role of Homecoming as a community event. Yes, it is a day of celebration and plays a significant role in the social life for a portion of the African-American community. But let’s not forget, that portion is not the entire African-American community, nor the majority of MNPS teachers and students. I take no issue with educators wanting to take the day off to enjoy the festivities of their alma mater. But they need to take ownership of that decision and make sure that their responsibilities are covered. The date is known a year ahead of time if you are planning to take the day off, secure a sub. There is no other job in the city that would allow someone to just take off work for a social function without having their work responsibilities covered. Gentry defends the action by saying that you can’t control the behavior of 6000 teachers. You just have to set the calendar and then they’ll decide their behavior. Huh? We can set high expectations every day for 80k plus kids, but we can’t for teachers? Imagine if I said, “Yea,I expected those kids to get that homework done. But I can’t control what they are going to do. I’ll just assign it and they’ll decide what’s important.” It wouldn’t fly. It’s always about the kids until it’s not. The calendar should be set based on what’s best for kids and teachers, period. Making allowances because someone decided to attend their college social function instead of filling their commitment to the kids in their charge, shouldn’t be an option. That’s called an expectation, and we always talk about the importance of high expectations for kids; what’s good for kids should be good for adults. Now that said, if the district wants to be proactive and survey teachers ahead of time to find out who’s going to be out and then build a sub-pool around that, I’m good with it. Maybe require all teachers planning a day off to file a form so accommodations can be made. If you are off and no accommodations were made, then it counts against your professionalism score on your evaluation. This might also be an area that the Nashville Public Education Foundation gets involved. What if a teacher for a day program was created where local businesses could supply employees to serve as substitutes for a day? The Nashville Public Education Foundation could coordinate and business would have an opportunity to learn more about what goes on in the classroom and how they can make an impact. Could be a win/win for everyone. Getting back to next years calendar, approval was shelved after board member Christiane Buggs pulled it from the consent agenda. The new proposed calendar puts Fall Break a week earlier, to coincide with the end of the quarter, and makes the Friday that coincides with TSU Homecoming a professional development day – the irony isn’t lost on me. Buggs wanted to make an attempt to shelve the new proposal and revert back to this year’s schedule which lined Fall Break up with homecoming. Buggs proposal was met with little enthusiasm, but because of her raised questions, board member Fran Bush decided she needed more information in order to cast her vote. As a result, Bush abstained and the calendar was tabled till next week. There was some hand-wringing from the chair and vice-chair that a terrible disservice was being done by the delaying of the approval of the calendar. If that hand-wringing has actual merit, my question would be, why, once again, is a crucial proposal being brought at the last-minute? If a student perpetually brought their assignments in at the last-minute or late, would a teacher not attempt to alter the behavior? Again, one set of expectations for kids; one set of expectations for adults. Next, on the boards, agenda was committee meeting updates. Earlier in the day, the board held a Director Evaluation Committee meeting. Gentry used this committee report to not only give a brief update on what transpired but also to lecture on her interpretation of the board’s responsibility and how they should behave. She makes some cryptic statements about “hiding behind being elected officials” and having managers at work without ever really connecting that voters are the boards de facto managers. There continues to be at play a weird hierarchy that places the director of schools at the pinnacle. That’s not quite correct. Education reform groups, which are largely comprised of subsets of business and industry, believe that local school boards are too political and get in the way of policies that support the wants and needs of business and industry. Their belief is that school districts should be run like corporations, or nonprofits that have a hands-off board of directors that hires an executive to run the organization, and that executive should be a business leader who can run the district like a business. The problem with this approach is that board members of corporations and nonprofits represent only themselves, and their purpose for serving is either financial gain, or to benefit a cause that is special to them. In contrast, locally elected school boards represent people. The efficacy of a corporate board can be measured by concrete results. The efficacy of a nonprofit board is measured by the satisfaction of its beneficiaries. The efficacy of a school board has been reduced to a letter grade, and the board is left with little ability to respond to the wants, needs, and desires of the people who elected them. Though each of these responsibilities carries equal weight, the responsibility to set policy is what defines the boundaries in which a superintendent can operate while implementing a vision that reaches the goals of the board. While it is ideal that regulation is minimal in order to allow a superintendent to lead the district, it is utterly important that the board set boundaries to define what is acceptable, and what is unacceptable, in every aspect of the operation. They must set policy that stays within the laws, rules, and policies of the State. What a board must keep in mind is that policies should be implemented with what is best for all students in mind, and the judge of a policy’s effectiveness is rarely the district leadership; but instead, the people who elected them to serve. 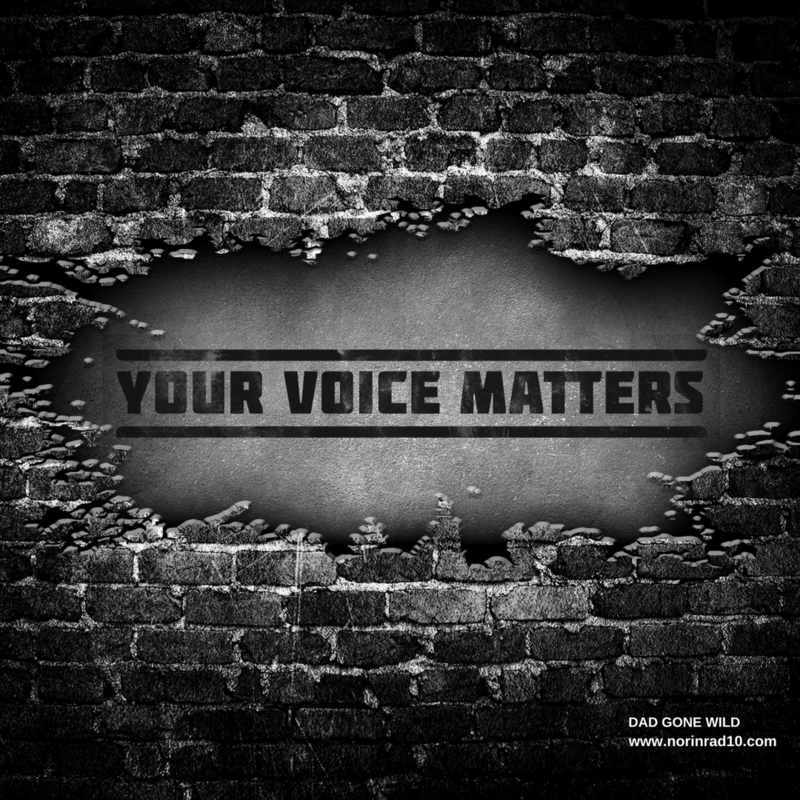 When you look at several issues – educator licensure, reporting of disciplinary issues, reporting of students receiving services for dyslexia – it’s clear that Joseph’s administration is not staying within the laws, rules, and policies of the state. That alone should supersede any perceived need for hyper decorum. Once again we have adults who worship at the altar of “the kids are first”, while indulging in behavior that allows the detrimental behavior to continue? Who pays while adults practice diplomacy? It’s kids, and it’s teachers – more on that in a minute. Neglecting the grass can be just as detrimental to the grass as elephants fighting. Gentry makes a statement, that basically says, “You can comment and try to exert as much influence as you want, and we sorta appreciate it, but in the end, it is in the hands of the nine.” The nine is the elected school board. There is some truth to that but a couple of things to remember, parents, don’t have to participate. They can leave the system, and Gentry may shrug at that prospect and say, “Let them.” But if you think MNPS is a chronically underfunded district now, just see what happens when it’s only serving families with no other options. Secondly, the nine can change. I hope Gentry remembers the part of her sermon about having a manager. The last election pitted a sitting school board member who was one of the directors biggest supporters against 3 challengers. The voters selected the most critical of the 3. I would think you ignore that message at your own peril. Voters sent Fran Bush to the school board for a reason and I don’t remember seeing anywhere that it was to worship at the altar of Shawn Joseph, nor Sharon Gentry. They elected her to make things right for kids and teachers, and she seems to be taking that to heart. Democracy can be messy. Maybe Gentry should spend a little less time talking, and a little more listening. After all, it seems politicians are starting to listen, not to mention local philanthropists. The last committee report of the night was on teacher compensation. This is going to be one of those areas where I’m going to be critical of people I have infinite respect for. There are people on the compensation committee that I feel are the best of the best. Look up model teacher/leader in the dictionary and you’ll see a picture of Michele Sheriff and Dr. Paula Pendergrass. That said, WTF? The presentation starts with MNEA president Eric Huth doing an impersonation of Jack Nicholson in As Good As It Gets. Lot’s of jocularity going on and then a 5-minute presentation that consists of a goal to make MNPS teacher among the highest compensated 5% of the state. There is no date attached to the goal, in all fairness, that is mentioned later. The slide also contains some platitudes about the approach of the district to compensation. The second lays out a timeline that designates November/December as being utilized for more discussion and research and a promise to report in January. That’s it. End of presentation. Couple things to point out. It’s October, budget talks begin at the latest in February. We’ve known since last year that teachers are pissed about salaries. All research and discussion should be wrapped up by now. The reality is, once the second week of November hits, nothing is getting done until the second week in January. And then once again, district leadership will be presenting a crucial proposal at the last-minute. But hey, have you seen the cover of Time Magazine. Dr. Joseph and his team have read it, so you know they care. Unfortunately pointing to that article isn’t enough. We owe it to teachers to present concrete steps that reassure that increased compensation is on the way. At this point, what do you hope to learn through further research and conversation? This has got to be a priority and as such should be treated with a whole lot more seriousness. While the committee is researching teachers are driving for Uber. While the committee discusses teacher are being priced out of the district. This process needs a whole lot more urgency. I suspect what’s going to happen is that the process will be dragged out while negotiations on Dr. Joseph’s contract renewal begin. An argument will be raised that the compensation process is so far along that if we replace Dr. Joseph, increased teacher compensation would be jeopardized. I’d love to see a board member bring a resolution forward that commits the board to the process of raising teacher pay independently of who is the superintendent. Again, no disrespect to the incredible educators who are volunteering their time to work on this issue, but that presentation shouldn’t be acceptable to anyone, nor should our current place in the process. And Dr. Gentry’s mocking of people at the TSU parade who were pressuring her to raise teacher salaries is way out of line. Remember that lecture about thinking purposely about what you are adding to the conversation? 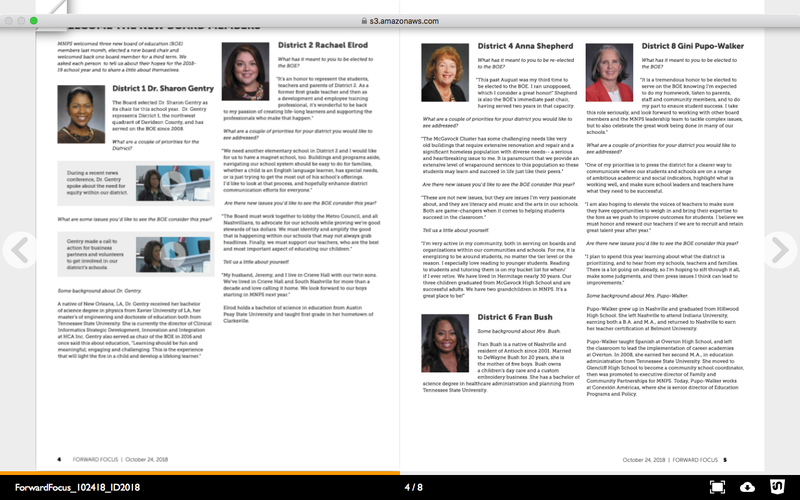 If you ever have doubts about how petty this MNPS administration is, all you have to do is gaze at the latest issue of Dr. Joseph’s Forward Focus. Another edition of, “If it wasn’t so serious it would be comical”. I hope Fran Bush has learned her lesson and received her warning. Fortunately for us this kind of pettiness appears to have no impact on Bush at all. Here’s a page from MNPS’s Forward Focus publication, which is sent out to all employees. Take a wild guess who is the least favored new board member by the Director of Schools and the new board Chair. Only one of the new board members was not interviewed for this publication. While there are four newly elected board members and conveniently four columns to highlight each of them, the largest amount of space is actually devoted to Sharon Gentry, who happens to be our longest-serving member. With such petty behavior, it’s no wonder things aren’t functioning well right now in MNPS. Our employees are being treated in the very same manner, which is causing a major culture problem. Whether or not Dr. Joseph and Dr. Gentry like it, Fran Bush was fairly elected by the public to serve one ninth of our school district. She deserves the same treatment as other board members. To treat her otherwise is to demean the voting public. This is but a small example, but professionalism and fairness have been thrown completely out the window. Time for change. Chalkbeat has an article out today about how changes in teacher evaluations have changed the job of principals. I’d like to offer congratulations. It’s often said that it doesn’t cost a cent extra to increase expectations for kids, but are high expectations really free? That the question that columnist Peter Greene recently asked. Expectations are just a form of faith, and even the Bible tells us that faith without works is dead. Expectations matter, but expectations are only a foundation and no, you can’t build the house for free. “Teachers should just expect harder,” is just an excuse for politicians and policy wonks to avoid the issue of giving underserved, underfunded schools the resources they need, the kind of resources and funding that politicians and policy wonks would give them if those guys really, truly believed in the success of those students. Again, I urge you to read the whole piece. Local blogger Vesia Hawkins also has a new piece out. Give it a read, I’m still sifting through my thoughts on it. I’ve got more to add to this subject based on observations with my own kids. Maybe Monday I’ll hit that subject. Congratulations are in order! Shelly Gaughan, a kindergarten teacher at East End Prep, was awarded the prestigious Milken Educator Award, which includes a $25,000 cash prize. She is one of 40 teachers across the country to receive this award. Just in case you think that our observations are completely out of whack…go back and read my May 21st post. There’s actually a few gems in that one, but I’ll let you find them. As long as this update is, I’d be remiss if I didn’t include Andy Spears latest update on Tennessee Teacher Evaluations. I want to leave you on a positive note, so here is a story from Channel 5 about students at West End Middle School learning sign language to improve communication with their hearing-impaired peers. Hit the link and enjoy. I put the odds of a token (1%) raise modestly high—about Vegas odds. Odds for a real (3%) raise are very very low. And chances for a raise that actually pushes us ahead of other districts’ growth rate (e.g., like 4-5%) are astronomically low. As usual, charter seat growth and health care cost increases will chew away any chance at going beyond 1-1.5% unless city council changes its tune. I don’t see it happening. The best shot was the one taken this last season, and we are going to be smarting from the licking we took there for a long while. Close but no cigar. Understand, too, that Bill Lee is probably going to take us backward on BEP funding. Wish I could be more positive. I don’t think Nashville teachers will ever get a decent pay raise that corresponds with the cost of living. 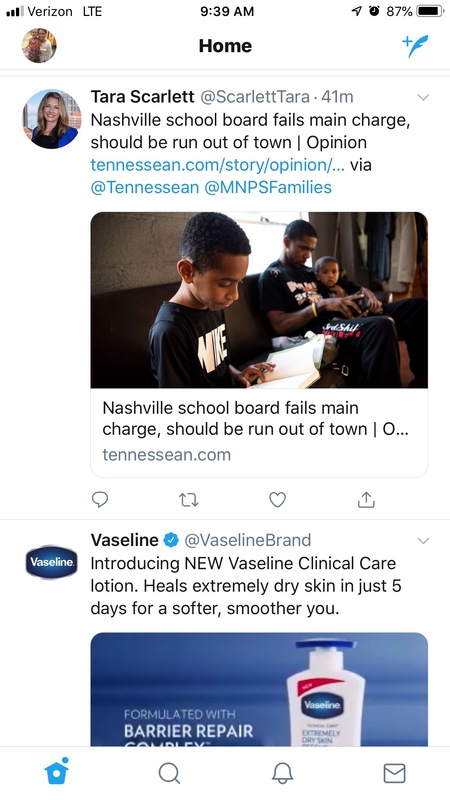 MNPS seems content with having a constant crop of young, inexperienced teachers who last a couple of years and then leave the system for private or suburban schools or a job that pays a decent living. Meanwhile, MNPS will cry out for “rigor,” while employing inexperienced teachers.